The events of the event Axis has resulted in a personality inversion for many heroes and villains in the Marvel universe. Tony Stark is one of those affected by this and has reverted to the selfish capitalist from before he was humbled by the events that made him Iron Man in the first place. 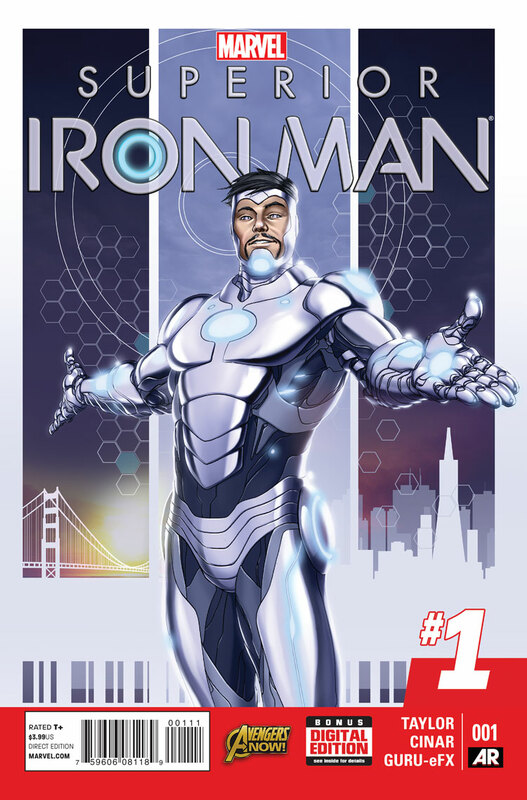 Superior Iron Man is the exploration of this new old side to Tony Stark. One thing I found interesting about this is that in Axis many of the personalities reverted back but it seems that this darker Tony Stark persona was actually stronger than his other personality and won the battle for dominance. It’s kind of rare to see the less desirable side of the character win the battle for control so I found that pretty refreshing despite the fact that the issue doesn’t do an awful lot with the idea. The first issue of this series is something of a mixed bag. Conceptually the idea of Iron Man reverting to being a selfish egomaniac is an interesting one but the execution leave a lot to be desired. Tony seems to be so nonchalant in his villainy which doesn’t really make him all that likeable. Maybe the point is to have the reader hate him but who’s going to read a comic where they hate the main characters? It’s also possible that it’s just me who doesn’t like him. I will say that some of the writing was pretty funny. Tony’s dialogue feels like it was written for the Robert Downey Jr version so fans of the films will be able to latch on here. I did quite like his plan to make everyone in San Francisco superficially beautiful through a smartphone app and the consequences that had for the people who chose not to use it or even are too poor to have a smartphone. I found it interesting that it caused violence between the pretty people and the normal looking people because Extremis enhances everything about someone including their most negative traits. This causes problems for recent San Francisco native Daredevil who has to help sort out this mess. It’s also an interesting move to have the app only have a one day free trial which robs people of their beauty and essentially has all of San Francisco right where Tony wants them. Quite nefarious really. It’s entirely possible that Pepper Potts is going to be the hero of this story as she is the one who calls Tony out on what he’s doing and is aware of how wrong it is. There’s a suggestion in the story that she is going to do something to actively stop him. If that’s the angle that they want to pursue then I do find that pretty interesting and maybe in subsequent issues they will do more with this dynamic and have Tony seem a little more complex. Side note and it’s an entirely aesthetic issue but I don’t like the Superior Iron Man suit, it just doesn’t do anything for me. I imagine many people will like it and it does look really sleek but I prefer more colour in the Iron Man armour. A mixed bag of an issue mostly brought down by how unlikeable Tony Start has become in his nonchalant villainy. It is interesting that the darker side of his personality has won but so far they’re not doing an awful lot with it. The story is nicely put together and Stark’s plan is interesting. I really liked the consequences it has for those who don’t want to/are unable to buy into his grand idea. There is lots of potential here for a great story. In general there are lots of good ideas in here but the execution of Tony’s character is entirely uneven. Hopefully this will get better in subsequent issues.